It began with my nephew saying to his dad, “let’s go before we can’t.” My brother, Greg, who has been dealing with MS for a number of years, liked the idea. So, last summer, they walked the Camino de Santiago in northern Spain, to the Apostle James’ legendary burial place. The rigors of the trip required serious preparation for my brother. Hiking 500 miles in 28 days means averaging almost 18 miles a day, and a good bit of the Camino involves hills and mountains. I learned more about this during my brother’s recent visit, when we viewed his pilgrimage photos. 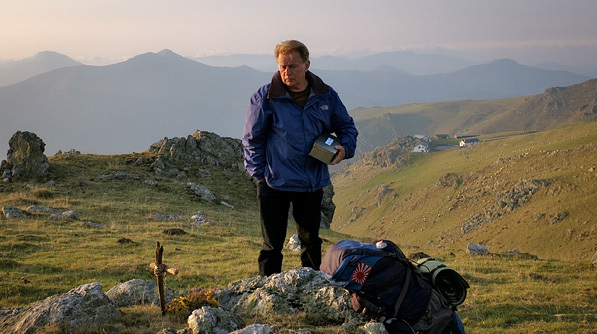 We also watched The Way, Emilio Estevez’s fine movie about the Camino featuring his father, Martin Sheen. I appreciate The Way for how it sensitively portrays our infirmity. Since ancient times, Christians have valued pilgrimages. Paths and journeys often provide metaphors for transition through life. For this reason, an intentional spiritual journey can be a microcosm for the whole of our life, and enable us to deal with enduring issues in a concentrated way. “You don’t choose your life; you live it,” says a character in the movie. Yet, quite often, we perceive a conflict between the things we cannot choose about ourselves, and how we really hope to live. The Way traces a Camino made by four people, each carrying a burden not so easily set aside as a pilgrim’s rucksack. Two carry burdens of grief; the third seeks to lose weight; and the fourth fears losing a writer’s vocation. All four journey toward deeper and hidden parts of themselves, and over the pilgrimage, lighten their ‘loads,’ figuratively and literally. The most challenging part of the Camino proves not to be the Pyrenees or the Meseta. For them as for us, the hardest journey starts from how we see ourselves, and moves toward the self-acceptance for which we yearn. Jesus did not spare the disciples their need to face themselves, and their own culpability in his death. Yet, by lovingly accepting them as they were, he enabled them to accept themselves. Accepting who Jesus really is, is interconnected with accepting who we really are. And accepting who we really are comes with accepting who Jesus really is. He has made himself one with dark things within us. Because of this, we can accept being made-one-with him, in his radiant light. A photograph from The Way (accessed from the Media page of the film website). Click here to view my Sunday homily exploring these themes in relation to Alanis Morissette’s song, “Thank U,” as well as the Sunday resurrection narrative from Luke 24:36b-48.